Welcome to Fantasy Charters and Lodging Home Page. The Affordable Dream. The word is out, Lake Ontario trout and salmon fishing is going crazy! Record catches of trophy fish are happening every day. And the best news is that YOU can get in on the action, with a phone call to Fantasy Charters. Our reasonable rates and Lake Ontario accessibility add up to one affordable fishing dream. Join Capt. Clyde Keck for a day or two of Lake Ontario salmon fishing, brown trout fishing, or bass fishing aboard Fantasy Charters. Capt. 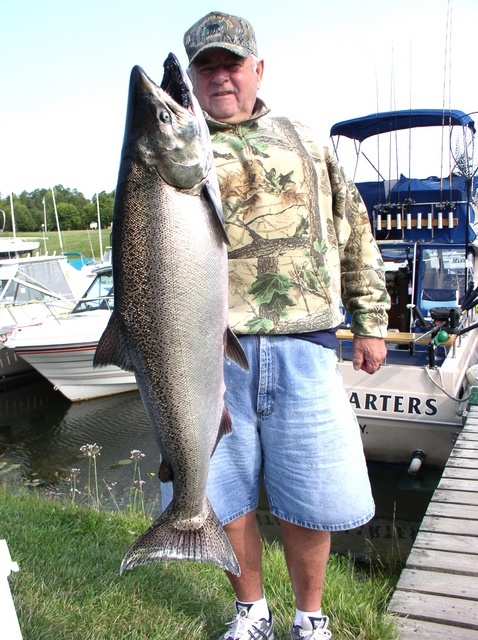 Keck's trout and salmon fishing Lake Ontario experience has been documented on TV shows like "Rod and Reel" and the "New Sportsman Show" and in magazine articles by the "Great Lakes Fisherman." 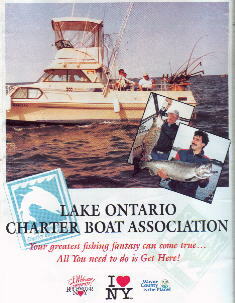 Fishing Lake Ontario for trout and salmon has been well publicized over the years. Bass Fishing New York has also been documented in articles like "Bronzebacks Booming in part of Lake Ontario" that can be found in the June 2001 issue of Field & Stream. The article written by Lawrence Pyne talks about the NYS Bass Fishing of Lake Ontario. Mr Pyne writes "While cormorants have taken a big bite out of the smallmouth bass population in eastern Lake Ontario, the smallmouth fishery along the lake’s south-central shore is enjoying the best of times." Fantasy Charters fishing guide service is centrally located between Rochester, New York and the Salmon River. This location gives us the advantage of being close to the best charter boat fishing all season long. Fantasy Charters has been proud to represent companies like: Berkley Trilene, Sampo Swivels, Super Ski Planner Boards, Rebel Lures, Stinger Lures, Acme Dazzler Lures, Attacker Lures, A-Tom-Mik Trolling Flies, R&R Tackle Co. Lures, and Fish Mate Thermocline Locator. 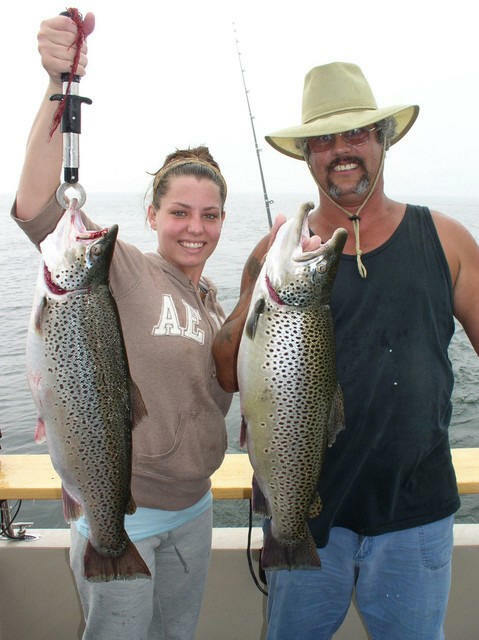 Fantasy Charters offers a fishing guide and lodging package for charter fishing Lake Ontario. SportFishing Lake Ontario with Fantasy Charters can provide a nice fishing vacation for anyone interested in a Lake Ontario Charter Fishing trip. Fantasy Lodging is exclusively used for charter customers. Our Lodging is conveniently located overlooking Fair Haven Bay. The Cabin is close to all the necessities you crave on vacation. Fishing New York State with a charter guide has never been so easy. Location is the key part of picking a charter boat. You have to be in the right location to fish for the species you want at the right time of the year. Fair Haven, New York is located half way between Rochester, New York and the Salmon River. This area is one of the best know brown trout areas on all of Lake Ontario. You get the experience of a captain who was raised on the Great Lakes and has fished here all of his life. Starting out with bass and moving up to trout and salmon fishing when the stocking program began in the early 70’s by New York State DEC.
Our mission in this web site is to give you as much information as possible, so you can make informed decision on charter fishing on Lake Ontario. Not all fishing charters are the same. Look for what will make your trip a safe and memorable one. Make sure the captain has a US Coast Guard license and is insured, the vessel is safe and inspected by the US Coast Guard, check our FAQ page for ideas of what to look for before making a discussion. Sometimes, the little things like having a clean, comfortable cabin and a close location to restaurants, stores, golf, etc. makes a great difference. Some charters put their clients in motels and they have to drive long distance to get to the boat each day. Copyright © 2000 Fantasy Charters and Lodging.